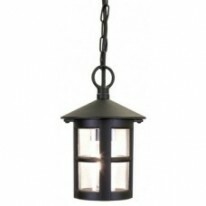 1641Genoa - 1 Light Outdoor Pendant, Black Silver..
70696A traditional die cast aluminium hanging lant..
YG-3503A traditional die cast aluminium hanging la..
YG-865-SSOutdoor pendant lantern constructed from ..
An indoor light for outside? no, these pendants are built to last through rain, snow, shine and wind, making them durable for outdoor use. These pendants can be hang from most surfaces and can provide enough lumens to light up an entire garden! They can be fitted where even there is solid grounding, this include hung from a post, inside a shed, side of a build, above a wooden enclosure or in a barn. With these fittings you can use a standard halogen bulb or make them more modern with LED lights. Are interested in one we sell? Brilliant! Our aim is to ship it out to you as soon as possible with one day shipping.